Staple goods are any items in your inventory that are core to your business. They are also known as any staple products, staples, core products, and necessity goods. 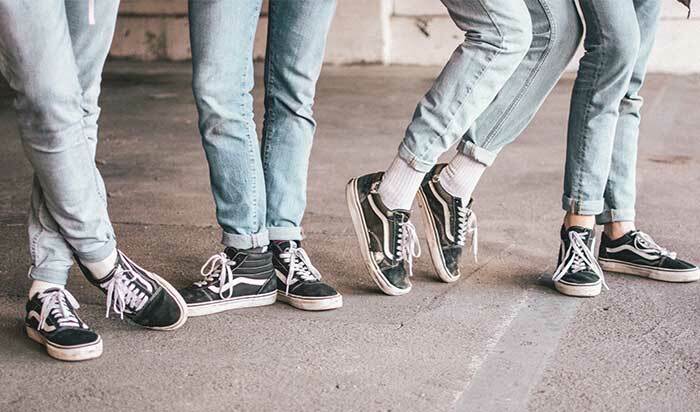 For example, vintage jeans and t-shirts are staples for any serious vintage clothing store. Skateboards are staples for skate shops. Golf balls are a staple product for a golf shop. If you have a store without staple products, then your store doesn’t stand for anything or isn’t representing anything special to your clients. Most of your customers are specifically aware of your staples and when you are sold out. Consider what would happen a week before your kids birthday if you went to a toy store to pick up a gift and they were all sold out. On a rare occasion, like a day before Christmas a stores shelves could be emptied of their staple goods, but even this will leave a bit a fear in customers who relied upon the shop in the past. Vintage customers seldom purchase staple goods based on price. This is very powerful knowledge for the retailer who understand this. Consider a customer who is looking to pick up something to wear to an event they have that night. They are hardly considering if an items cost more than an other, they need something that looks good and fits immediately. The staple that they are purchasing from you will complete their look and they came to you for it. The same can be said if you are the way to a family picnic and need ice and drinks. You stop at a shop on the way that is convenient, and even if you do complain about the price, you will still purchase it. Imagine going to surf shop and they are all out if surf wax. What would you think of that shop? What would it do for your confidence in that retailer? Would you go there next time you needed wax? If the item was a staple good you needed, the chances are are more likely that will not shop there again. 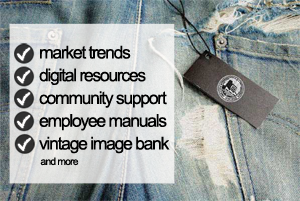 Now imaging if it is a customer coming to you to find a pair of vintage jeans or a t shirt in your store. This is something that you should always have a plethora of and something that anyone in your area would expect to find in your store. If that customer comes in and your selection is dismal, or non existent, not only did you loose a potential sale, but a lifelong customer. In the vintage clothing industry, there is often a lack of attention paid to the staple products. These products often get relegated to “accessories” status in the store. While it is true that many staple products are compliments or accessories to other items —you need a dress before you need a necklace, for example — the truth is that many customers shop your store just for the staples and they expect you to always have them on hand. So it will behoove you to pay close attention to keeping them in stock. We have buyers for stores that claim their vintage store could be a sunglasses store. So many customers added a pair of sunglasses to their outfit, that soon they were returning for sunglasses alone. They started by purchasing one or two outfits a month with some accessories. They eventually ended up purchasing a couple outfits a month, along with a pair or two of sunglasses a week. The net result of relegating your staples status to accessory status is that you treat it as a second-class citizen in your inventory management. In other words, you need to reserve some open to buy for these items each week. Too often, a retail store will buy too much “trend” inventory using up all the available cash flow from open to buy. This means when they run out of the staple goods, they lack the funds to replenish them. And this will dramatically affect the customer experience and your overall sales.